One car and two trucks arrived at my house at 10:30AM loaded to the gills with fishing and camping equipment. With everyone working together, we found room for my gear. I jumped into Homer's Volvo station wagon. His friend Michael Duncheon in the front seat, we followed as Oscar Guzman in Mike Pinelli's truck took the lead with John Files in Les Penpraze's truck close behind Mike. 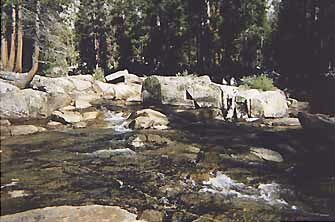 We left Pleasanton headed for Vermilion Valley Resort at Lake Thomas Edison, via the Clovis ranger station. We made the ranger station thirty minutes before closing and got our wilderness permit. After two hours of driving a windy, mostly one lane road we made our destination for the night. We ate dinner at the resort that made a living feeding and restocking the Lake Edison fisherman and hikers who come in from the John Muir trail for a shower, clean bed, and fresh food. Many continue on to complete the 200-mile plus trek while others come out and head for home, another section completed. Most of the fisherman had left the lake as it had lost a great deal of water in anticipation of being refilled this spring. Winter comes early here and they close in another five weeks for the winter. At 9PM it was off to bed in the new hardback tents, everyone anxious for tomorrow's horseback ride up into the woods. I sat out by the campfire and asked questions of the folks who came in from the John Muir trail or were headed out. One couple said the worst thing that happened on the trail was running out of coffee and vodka two days from any supply station. I went to bed comfortable in the knowledge we would run out of neither. Up at 7AM, we drove ten minutes up to High Sierra Packing, a family owned and operated business since 1949. The wranglers went to work right away putting our gear on the mules. We left for breakfast back at the resort while they worked. After breakfast we returned to find all our gear packed on ten mules and the wranglers ready to go. 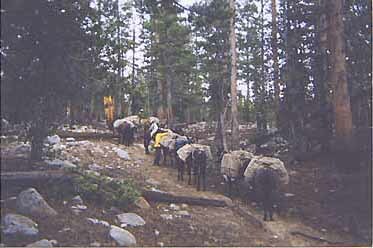 They offered to give anyone a drive up the road and meet the mules some forty-five minute ride up the trail. Michael was the only one to decline the offer. We met the horses and mules at Lake Edison dam. At 10:30AM we were mounted and on our way with clouds threatening rain. Fortunately all of us were prepared for the rain based upon Mike's well-prepared briefing we had a week before the trip. It sprinkled and rained pretty good at times along the way, just enough to reduce the dust on the trial. Just before arriving at Kit Camp at 2:30PM it stopped raining enough for the wranglers to unload. Just as they left it started to rain again. Again Mike's preparation paid off as we had a tarp big enough to lay on the ground and on top of our gear, protecting it from the rain. So we rushed to get the kitchen canopy up and the custom built cherrywood john in place, complete with tarps for privacy. 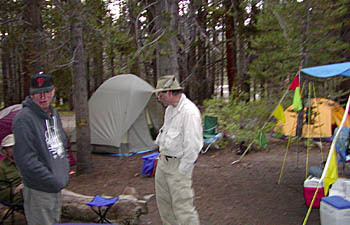 Shortly thereafter it stopped raining long enough for all of us to get our tents up and gear stowed. We never did eat lunch and only survived on snacks we carried in our backpacks. Everyone was tired and hungry. Unfortunately it was my turn to cook dinner. I say unfortunately because I am no cook. The plan was that George Conway would cook but a family emergency prevented him from coming at the last moment. Fortunately George had marinated the beef and chicken for the fajitas. (He did all the shopping as well.) Oscar and John came to the rescue and helped with the cooking. There was so much food that we ate leftovers everyday up to the last day! And we didn't even cook the beans and rice! Several guys jumped in after dinner to clean dishes. Camp was now up and running smoothly. People hit the sack between 9 and 10PM. It rained on us during the night, but when we awoke in the morning, no one got wet. It also got pretty cold last night, but that's another story. By 10AM everyone was out fishing on the river/stream that was only one hundred feet from our camp. Some went up and some went down the river to try their skills at landing the expected golden, brown, rainbow, and brook trout. Today I caught my first brown and golden trout. The golden is the most colorful trout I've even seenundefinedso beautiful. All the trout caught were small, with seven inches on the larger size. 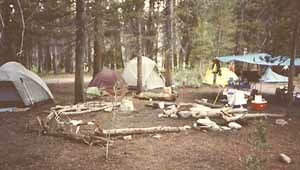 Back at camp for dinner, we all had stories to tell around the camp fire about today's fishing, for many of us the first time up in the Sierras like this. Homer and Michael cooked pork chops for dinner, again plenty of leftovers. The thing Mike neglected to tell each team of cooks was how much food to bring. Turns out everyone but Mike and Oscar brought too much food. It rained that night and it got cold. I got up and my thermometer said twenty-eight degrees. Mike said it wasn't that cold and his river thermometer said it was thirty-six degrees. I said it was freezing outside and pointed to the frozen drops of water on the kitchen canopy as proof. John then went on to explain how the water droplets could be frozen and it still not get below freezing. Something about looking up at the cold sky. More to follow on this story later. Mike cooked special sausage and eggs for breakfast. 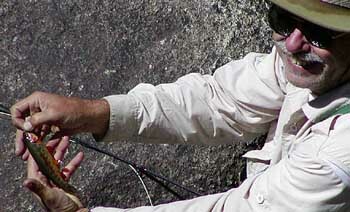 John and Michael decided to hike some six miles UP the John Muir trail to fish Marie Lake. Meanwhile it rained and hailed on us while some of us fished around camp. John and Michael returned in the late afternoon. They hiked three hours to get to the lake, fighting through some pretty cold and wet weather. They were rewarded with some twelve-inch brooks. John kept one for our planned fish potluck on the last night. 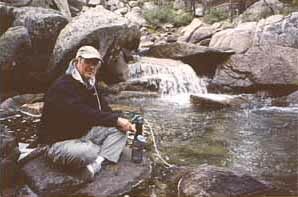 On the four-hour return down the trail, (they stopped and fished the stream on the way down) Mike caught a twelve-inch golden trout, (the biggest of the trip) which he kept for the dinner as well. I am not so sure if they had known what they would have had to go through, they would do it again. Just after dark, while we just sat down for dinner, a forty-five year old lady named Charlotte came down the trail next to our camp with a larger pack on her back. Mike invited her to pheasant dinner, he also warned her about the possibility of getting some shotgun pellets. She joined us next to the campfire. She was from Santa Cruz and she told us stories of her many adventures around the world and camping in the Sierras. Being very dark, Mike invited her to pitch camp with us, but she declined after seeing all our food in coolers on the ground. She was too concerned about the bears and declined. People were fishing with the same pairs and by now everyone had caught fish. We were learning where the best spots were and what flies worked, all of us getting comfortable with the stream. 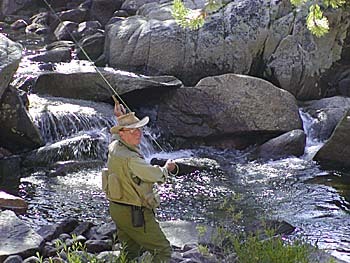 I for the first time began to understand what all those books were trying to convey about fly fishing a stream. 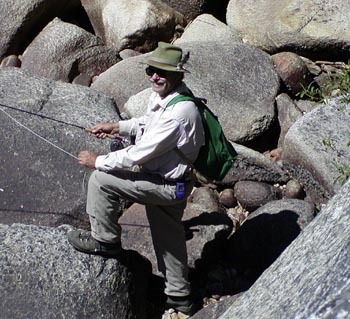 I was beginning to feel like a fly fisherman. Saturday morning and the skies are clear and sunny, but it was cold last night. Again I checked my thermometer and again it said twenty-eight degrees. Mike didn't believe and went to his stream thermometer and discovered it was at its lowest reading of thirty-six degrees. I felt vindicated until John started to explain how it could be below freezing and the water drops didn't necessarily need to freeze. He didn't bother to explain that one to me. Being that it was sunny I decided to take my video camera and took video of each of the guys fishing. I plan on making a short video of the trip. I'll see after I view the footage I got. That afternoon I went back to fishing as really was thinking I was a pretty good fisherman, I got skunked until the last half hour. What a humbling experience fly fishing can be. John and Lester cooked pasta and sausage for dinner. The sausage was very good and we finally had a "white man's fire" instead of an "Indian fire", which meant it was actually warm. That night I spent about thirty minutes just staring at the night sky. The stars were a brilliant white against the black background. The Milky Way spread across the sky. So many stars to see, constellations got lost in the clutter. I got to see several shooting stars and several satellites which pleased John as some of them he may have been directly involved is designing. The night sky was worth the entire trip. Sunday morning and it's twenty-eight degrees outside (really). Everyone had oatmeal for breakfast. We will need to ration the propane as we are using more than anticipated. It's been cold so we'd been heating more water than usual. I used a can to dry out my tent on Friday when I left the ground cloth open and rain got under the tent, thus getting it wet inside. We ate leftovers for breakfast. Everyone went downriver this morning without much luck. In the afternoon we spread out more and upon returning Oscar out-fished everyone, spending the afternoon in a pool just below camp! Dinner was put together mostly by John. It was made up of leftovers and it tasted great. We had planned on cooking fish we had caught during the days before, but the fish were too small to be taking them out of the river. Luckily we had plenty of leftovers. Throughout the trip there wasn't a lot of talk about exact numbers of fish caught, I think it was because the first liar loses. But people were catching and releasing from from six to twenty fish a day. It's my best guess that John out fished us all and Mike caught the largest fish. The favorite flies really ran the gamut: yellow humpy, Prince nymph, pheasant tail, royal coachman, grasshopper, beadhead PT, light Cahill, and royal Wulff. Monday morning and it's a toasty forty degrees outside. 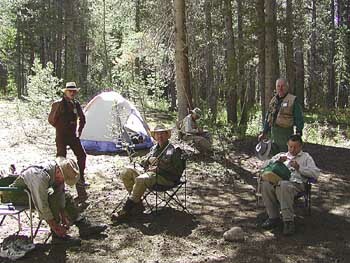 Everyone got up at 7AM, ate, packed, and broke down the camp in preparation for the wranglers to arrive at noon. We were ready at 11AM and the team arrived at 12:30PM. Enough time to fish a little more if anyone wanted to, no one did. We left camp at 2:05PM, this time riding ahead of most of the mules, thus avoiding much of the dust on the trail. After traveling fourteen miles on the trail, we arrived at the pack station at 5:55PM. We had all our things back in our cars and were on our way home at 6:50PM. The memorable part about going home was getting to Fosters Freeze after it closed and having to wait to eat dinner. On the way we missed a right into Madera and went all the way into Fresno. The best part was finding a Carl's Junior open. We were so hungry we all ordered the "$6 Hamburger". Homer, Michael, and I finally arrived at my place in Pleasanton at 1:10AM. They unloaded my things as quickly as possible and headed on to their homes to arrive at who knows what hour. We all had a great time and I seemed to hear everyone planning to go on next year's trip to Lake Lillian, a closer location to home. Michael planned on joining the club and attending the next meeting. We all owe a special thanks to fishmaster Mike Pinelli for all his planning and helpfulness and for assistant fishmaster Oscar Guzman for jumping in and helping every chance he could. Everyone pitched in when needed and it made for a very enjoyable trip.